I have drawn and painted since I was a child, but since I was born into a family of English teachers, I studied literature rather than art for my undergraduate degree at Wellesley College. My first formal art training came in graduate art school at The American University, where all the instruction stressed the formal qualities of art: line, value, color, composition. Concern with either subject matter or narrative was virtually taboo. But when I later began teaching at Virginia Theological Seminary (a seminary of the Episcopal Church), I helped my students explore images that examine the Bible. As a result my art was gradually transformed and today I am particularly interested in depicting narratives from Scripture and from the life I see around me. I also undertake church and institutional commissions depicting scriptural narratives. My most significant mentors have been Rembrandt, Käthe Kollwitz and the magnificent sculptors and painters of the late medieval period. Since many of my studio techniques are hundreds of years old, I often feel as though I have reached back into earlier centuries for what I do as an artist. This photo was taken as I was nearing completion of Reconciliation (representing the parable of the prodigal son) for Duke Divinity School. I am wetting down the full-scale plaster model, which was later taken to the foundry for casting in bronze. See the website article below on Reconciliation, which includes details about this commission. 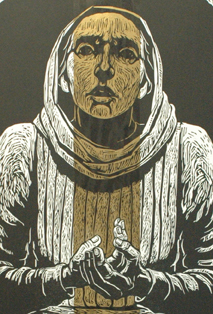 I am a printmaker (making woodcuts and etchings) and a sculptor. I work in a representational style and I often treat religious and social justice themes. Viewers frequently ask how I select the medium for a particular subject. I answer that each medium has its particular characteristics: woodcut has a raw power and directness; etching - with its range of grays - conveys greater subtlety and nuance; sculpture exists in our own physical space and draws us compellingly into its multiple views. I hope to suit the medium to the subject at hand. 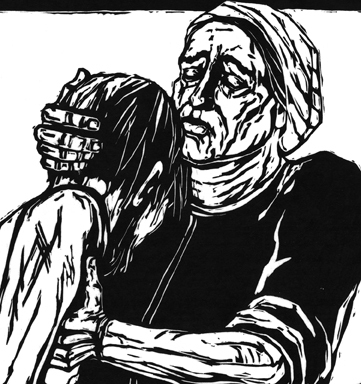 For instance, the woodcut medium was appropriate for my Stations of the Cross. But I will create etchings for the more intricate and detailed depictions of the biblical Easter Vigil readings (a project that I will undertake as Artist in Residence at the Luce Center for the Arts and Religion at Wesley Seminary, Washington DC, in 2013-14). And I always welcome the opportunity to sculpt an image in three dimensions for a particular space. I feel called as an artist to bear witness to the world I see around me and also to the ways I understand that world. This yields not only images of beauty and tenderness, but also images of suffering and terror. I want my work to draw viewers into my experience, inviting them to see through my eyes and hands, heart and mind. I don’t draw a line between the religious and the secular in my work. I want my depictions of scenes from Scripture to seem grounded in human experience and I strive, conversely, to show the holiness of all life that we see around us. I find the biblical portrait of Mary particularly compelling. She is addressed (correctly, I believe) as Blessed among women; but I see her also as Woman among women and I have tried to convey this understanding in my depictions. 1. 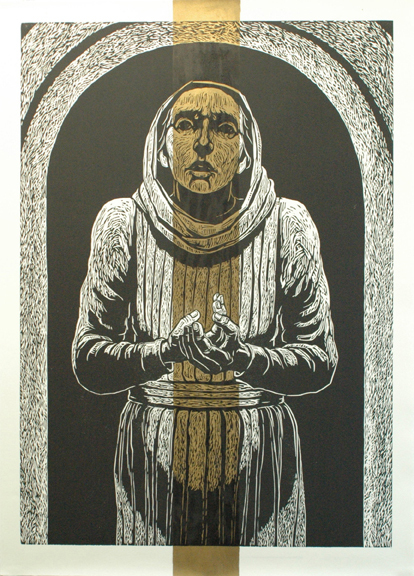 Here I Am (Annunciation), 2006, woodcut over stenciled gold leaf, edition of 15, 68cm x 48cm. Medieval images use rays of gold leaf to represent the moment of the Incarnation, and I had this in mind when I depicted a wide swath of gold descending through Mary’s body. Her youthful face expresses her awe while her hands reach out in a gesture of acceptance. 2. 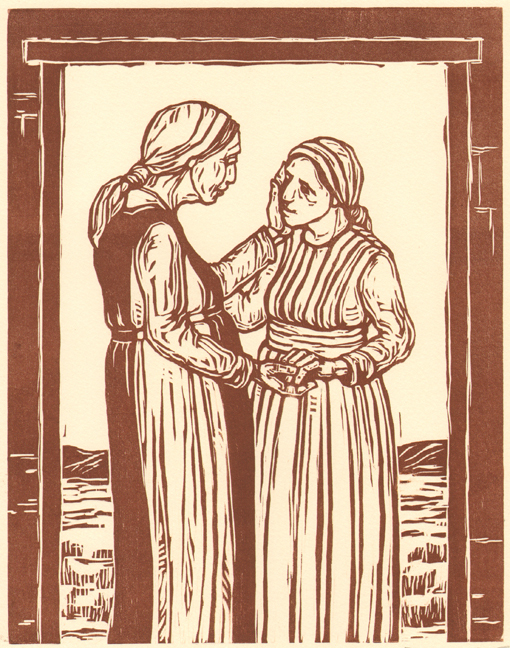 Mary and Elizabeth (Visitation), 2005, woodcut, edition of 15, 23cm x 18cm. 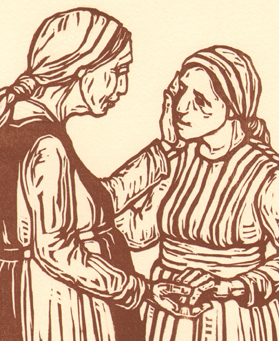 I have always been moved by the exchange between Mary and Elizabeth, with Mary seeking comfort from her older cousin. I envision the scene as a tender moment, when these two women - ordinary yet extraordinary - share their love and concern for each other. I used brown ink instead of the black that I normally use, since that seemed too stark for the intimacy of this exchange. 3. 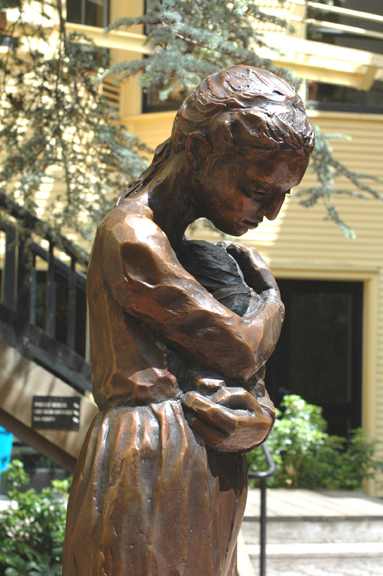 MARY, 2000, bronze, edition of 10, h – 122cm. I show Mary as a young woman, her body still showing the signs of her pregnancy. She is vulnerable, as all new mothers are, through the vulnerability of her infant. But Mary alone bears that prescient awareness of the nature of this child and the suffering foretold in Simeon’s prophecy, ‘and a sword will pierce your own soul also’ (Luke 2:35b). 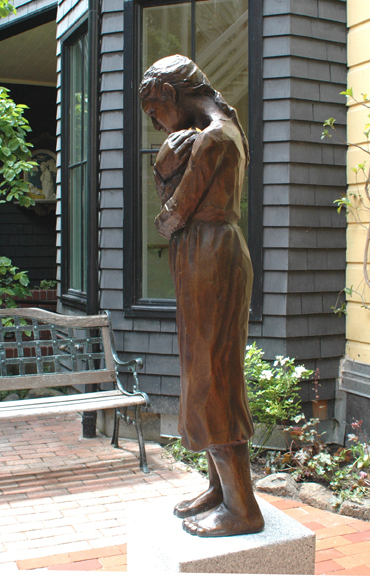 These photographs show the sculpture at The Episcopal Church of St. Mary the Virgin in San Francisco, CA. Other casts of MARY are installed at the Cathedral College (on the grounds of The National Cathedral, Washington, DC); at St Mary’s Episcopal Church, Arlington, VA (my home parish); at Iglesia Santa Maria, Falls Church, VA; and at St. John’s Church, West Hartford, CT. There are five casts remaining in the edition. 4. 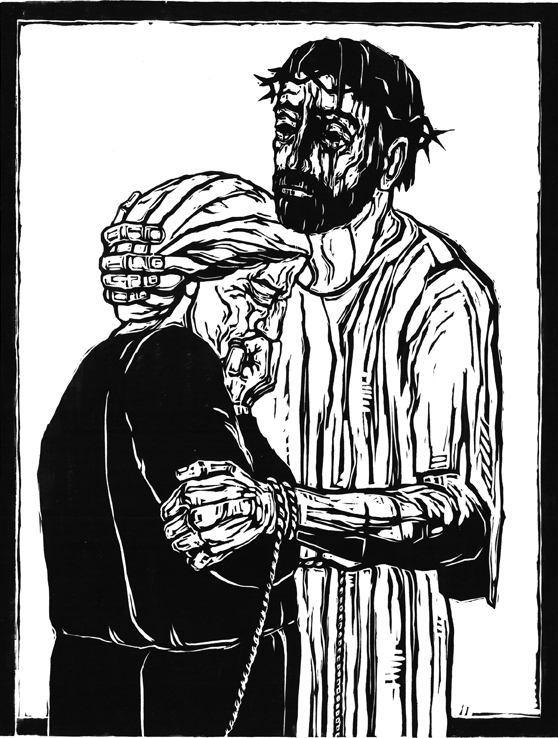 Jesus meets his grieving mother (Station IV), 2003, hand-printed woodcut, edition of 50, 60cm x 46cm. 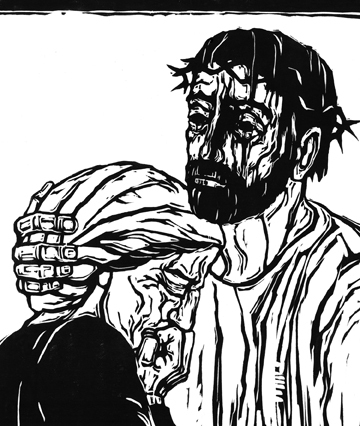 There is no description in the biblical account of Jesus’ meeting with his mother on his journey to the cross, nor of her cradling his dead body in the Pietà. I am grateful that the traditional Stations of the Cross correct this omission. In my StationsI show Mary as neither beautiful nor young. In her grief she is comforted by her son, who embraces her with the same gesture she will use when she holds his lifeless body. 5. 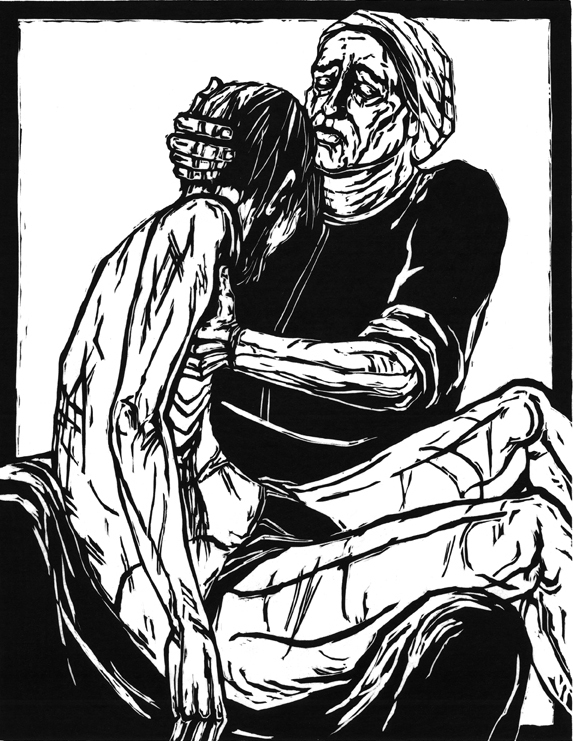 Pietà (Station XIII), 1998, hand-printed woodcut, edition of 50, 60cm x 46cm. Mary’s gesture, as she pulls her son’s head to her breast, echoes Jesus’ gesture as he comforts Mary in Station IV.